Last weekend when Julia and I were tottering around the trendy Pentagon City retail area known as Pentagon Row, we were drawn in my a little French restaurant called La Creperie. Being crepe fans and not often running into cool-sounding crepe places, we decided to head inside and make an early dinner out of crepes. Though small and potentially lost among the myriad shops and eateries in the vicinity, La Creperie seemed quite popular yet efficient, with a grand total of two people serving perfectly as host, wait staff and bus-staff. The menu was equipped with a variety of French comfort foods including omelettes, soups, sandwiches on croissant and a bevy of sweet and savory crepes. We noticed a rustic potato gratin, a sweet crepe with crème de menthe, vanilla ice cream and walnuts and a savory crepe based on ratatouille. Additionally there were some classically known crepes like Nutella/banana and ham/cheese. Plus, the menu offered a nice value, with the crepes only running about $9. We decided, that after walking around the chilly outdoors for over an hour, to start with some soup. Julia tried some tomato and I, some French onion. They were very nicely done for a starter, in little crocks – just enough to be an above average cup but not nearly a bowl. The tomato was very tasty without being too creamy – subtle and elegant. It had the rustic taste of well, real tomato, which is not always a given with tomato soups. The French onion was a little different than most, with a lighter, herbier broth rather than the beefy, richly onion broth I am accustomed to. It was a nice taste though, with a hearty amount of actual onion. This helped make it a more delicate soup where the onions themselves were providing the soup's flavor rather than the broth. The customary cheese layer was not egregious and didn't even have the crouton layer than many versions have. This was appreciated, at least in this case, where an extra thick layer of salty cheese and bread could have overwhelmed the nature of the soup. 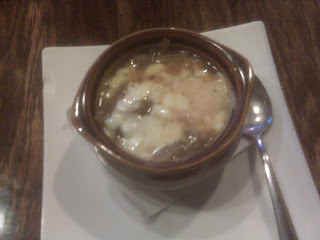 In all, both soups were tasty and intriguing opening bites. The main story though were the crepes. We decided on savory crepes, with Julia ordering a spinach and brie crepe with an herb pesto, and I sampling the bacon and cheese crepe with tomato sauce. 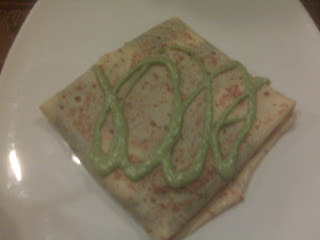 Julia's crepe was very tasty, as expected. I almost ordered that one myself. It was actually pretty heavy on the spinach, with the cheese more of an accompanying flavor and the pesto just squirted on top. The crepes themselves were nice and big, with that light chewiness I look for when I eat a crepe. It has to have enough body to hold and stand up to the ingredients within and be a component itself, and this crepe did its job well. My crepe was also tasty. You can't really go wrong with a meat and cheese crepe. It had plenty of nice, smoky bacon in it, except it was all in bits. This kind of made it like sausage consistency, which would be fine, except that in a crepe that aspect causes the bacon to fall out of the crepe every time you cut a piece. 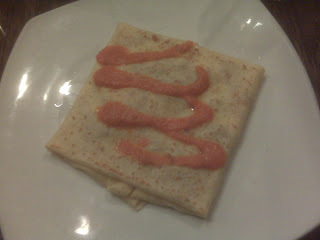 This one was also a bit light on the cheese and the tomato sauce (squirted atop) so those elements weren't able to hold the bacon inside the crepe any more proficiently. I think a little more tomato sauce to add more flavor contrast, larger pieces of bacon for ease of eating and a more noticeable variety and/or amount of cheese would have added to both the depth of flavor as well as the ease of consumption. With a crepe, you want it to be a delicate treat to savor, but when you're chasing bacon bits around your plate it's a little harder to savor. In all, both soups and both crepes were tasty, if not perfect, the service was quick and friendly and the atmosphere cozy and inviting. All that plus the intrigue of some of the other menu items likely means that the two of us will be heading back to La Creperie soon and maybe often. Sometimes one of our PLACES need not be absolutely perfect, but more so pleasing to the five or ten or twenty senses that keep us thinking about that place long after our final bite of crepe. This place has that charm so far – the rest will remain to be seen.